The ESPO Award 2017 will be presented to the port authority that succeeds best in the societal integration of the port with the city or wider community in which it is located, through involvement in art or culture. The five projects that are shortlisted for this year’s Award are the projects of Antwerp, Brest, Guadeloupe, Oslo and Venice. ESPO is proud to present the shortlisted projects before the winner is announced during the official Award Ceremony at La Tentation in Brussels on 8 November 2017. ESPO: Congratulations! You have been shortlisted for the ESPO Award 2017! Could you briefly describe your project? Providing the general public with access to local port heritage: During the European Heritage Days in 2014, the harbour master’s office in Pointe-à-Pitre was opened to the general public. At the same time, the fence around the port was used for an urban exhibition of photographs. Furthermore, the port hosts the annual Pool Art Fair (an international contemporary art show) in the Cruise Hall in Pointe-à-Pitre. Supporting local artistic creativity: GPC provides artists with atypical exhibition venues and work spaces, for example a wall around Basse Terre passenger terminal on which a big fresco was created. Additionally, the port has a policy of buying local art and promoting local artists across its network. GPC also supports exhibition projects of local artists, abroad as well as at home, and it supports the restoration of artworks. 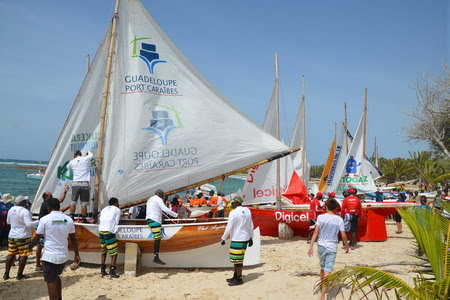 Sponsoring initiatives with a maritime and heritage appeal: For example, GPC is a sponsor of a traditional sailing boat race. The event is a symbol of the rich cultural heritage that developed around maritime activities, which should be preserved and made available to everyone. Supporting cultural initiatives that address the preservation of tropical biodiversity: The partnership between GPC and the ONF (France’s National Forestry Office) is one of the key ways for the port to ensure that the knowledge needed to safeguard this exceptional heritage is passed on to future generations. Furthermore, within the framework of the Cáyoli Junior Art Competition, awareness sessions were given in schools. 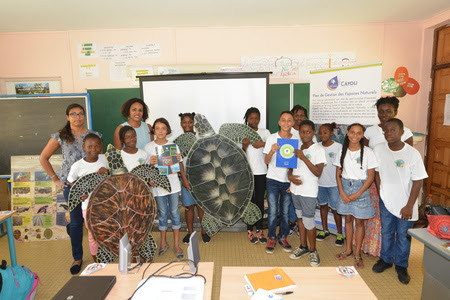 Afterwards, the children created an artistic work related to the preservation of Guadeloupe’s nature. Raising awareness of local port culture: On the occasion of GPC’s 40th anniversary, a film was produced about Guadeloupe’s maritime and port history, which was freely shown to the public. Thanks to the combination of archive images and insights from historians, citizens could (re)discover the importance of port activities in the development of Guadeloupe. ESPO: How does your project contribute to the societal integration of the port? The project launched by Guadeloupe Port Authority opens the port to the city. By giving residents the opportunity to visit historic buildings or by turning port facilities into art and cultural venues, we encourage people to come and get to know their port and gain a full sense of ownership of it in a different way. Assorted target groups of citizens are involved to varying extents in the project that we support. We help artists to grow, we raise young generations’ awareness of their homeland’s heritage while harnessing their artistic creativity. Furthermore, we support associations that implement initiatives with a maritime or heritage angle and we also enable our employees to express and share their artistic potential. This list, which is not exhaustive, shows the diversity of people reached by our project. The objectives of the agreement signed recently with the Rector of the Académie de Guadeloupe includes one major goal: to establish a context that encourages the emergence of vocations related to Cáyoli, GPC’s Natural Areas Management Plan. Safeguarding the natural heritage in the port area and in the archipelago in general, requires gaining awareness now by the people who will become the driving force of a sustainable development, built on the islands’ unique biodiversity. ESPO: Could you describe the original and innovative character of your project? As 95% of the goods traded between Guadeloupe and the rest of the world pass through Guadeloupe Port Caraïbes, the port authority is a public institution that acts in the service of the islands. We play a major strategic and regulatory role for the local economy. In line with this mission, our approach to art and culture is designed to serve people on and from the islands. Our goal is to promote and develop this artistic and cultural heritage, which acts as a societal cement. In particular, we are driven by a desire to support artistic and cultural creations generated by Guadeloupe’s maritime and port sectors so as to encourage their development. The sea has a wonderful capacity to transmit cultures and is an infinite source of inspiration for artists. Moreover, spreading port culture and tying it together with the archipelago’s history helps residents to regain a sense of ownership of the port and, more generally, of the sea. Through the project, we involve our employees who, as the first ambassadors of the port, constitute an essential target. Accordingly, we enter a ‘Guadeloupe Port Caraïbes’ crew into the Traditional Sailing Boat tour of Guadeloupe, we arrange cohesion days at the ONF (France’s National Forestry Office) tree conservation facility and we showcase artistic talents through the Port Art Fair, where we invite artist employees to exhibit their works on the port’s premises. ESPO: Why do you think your project deserves to win the ESPO Award 2017? With “Port’Art”, we are developing in another way our relationships with our institutional and economic partners and with civil society, and at the same time we are building new relationships with young people in particular, and more broadly with the community. Art and culture are at the centre of a virtuous circle enhancing mutual understanding, quality of dialogue and appeal of the Region. Today, we can fully measure the benefits of our initiative in terms of societal integration; this project represents a true “soft power”. ESPO: How would you make your experience in developing the project available to others? “Port’Art” is built and developed in line with the situation and with the challenges faced by our Region. Taking the time to properly evaluate those factors, so as to elaborate a rich and coherent project, represents a key stage in the process. Listening attentively is therefore essential and makes it possible both to anchor the project and to give it complete authenticity. That is the main lesson that we have learned and that we are able today to share, notably with the ports with which we are already networking. Through the Port’Art project, we put art and culture at the heart of a virtuous circle in the service of the territory of Guadeloupe.